We're going to cut straight to the chase: our top pick for the best wake tower speakers based on our extensive research for overall quality, reliability, and cost-efficiency is the BOSS Audio 8" 3-way 1000W Marine Wake Tower. How Do I Install and Position Wake Tower Speakers? Although not totally waterproof, these top-of-the-range speakers have been built to last in an aquatic environment. All of the main components of this speaker have been coated in order to protect them from the typical corrosion you could expect from a lower quality set. Beauty isn’t just surface level; it is also conveyed through the sound produced by these speakers. Hands down, a well-deserved first place on our list. 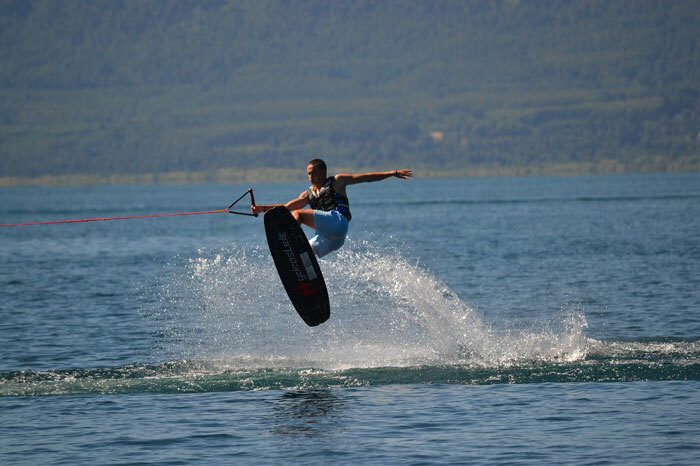 In order to put together these wakeboard tower speakers reviews, we have looked considerably for a set which can provide the ultimate experience from top sound quality to durability. These deliver a clean sound with little, to no distortion. Designed for an aquatic environment, they’re UV resistant for constant exposure to the harsh sun and an enclosure which has been treated specifically for use in a marine environment. Further still, these wake tower speakers are designed to withstand salt-fog, which can be a common problem if you’re planning on taking them to the ocean. Currently sitting at a price of $529 on Amazon this is cracker of a deal and probably the best wakeboard speakers for the money, at the moment. Of course, some other of the tower sets can come in at a lower price, however if you’d rather opt for quality, then the BOSS Audio set should not disappoint you. If you really have the money to spend, then you can consider Wet Sounds Revolution Series 10, which is going for $1,198 on Amazon. The BOSS Audio set comes with a whopping 3-year warranty, should you have any issues with them. They have truly been beautifully designed, inside and out. Designed as wake tower speakers, they are built to hang from its sturdy clamp. 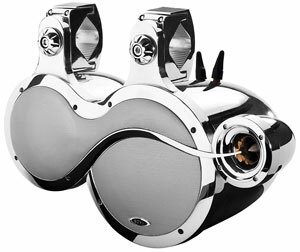 A pair of speakers which will surely make a great addition, both visually and audibly, for any boat set up. While still delivering decent sound, these boat speakers aren’t waterproof but are probably the best cheap wakeboard tower speakers you’ll find. 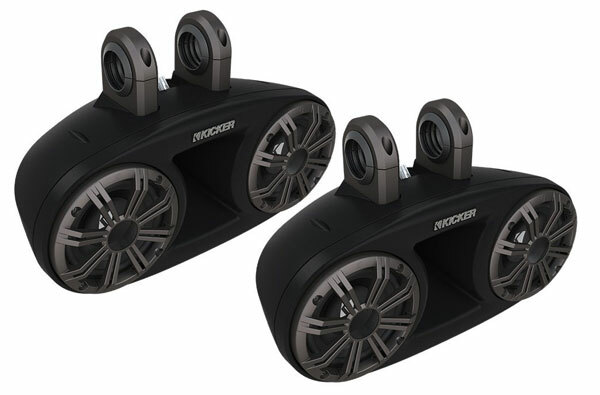 Labelled as ‘weather proof’, they are max 550W output and are sold as individual speakers. At a price under $100, you can’t expect top-of-the-line quality, however you can still expect decent sound. Coming a close second is an exceptional pair from Kicker. You can pick this set on Amazon from $329 which is an amazing price given that they are selling on the official website for nearly double that, at $599. The peak power on the KMT67 system sits at 300W, compared to the 1000W of the BOSS Audio speakers we reviewed. The woofer is slightly smaller too, coming in at 6.75in versus 8in from BOSS Audio. When you purchase these, you get four speakers with it, which comes in two separate sets, so you really do get value for money. Mounting them shouldn’t be a problem either as they provide a flexible and easy experience. They’ve been designed so that they can either sit above or below the bar. The bonus of these boat tower speakers is that they come with a three-year warranty, which is typically longer than most others we have looked at. Having said that, you shouldn’t have any problems with them as they have been built to withstand corrosion from being in a constantly humid and damp environment. 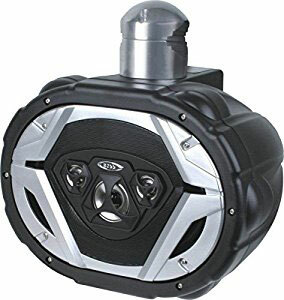 Whether you’re using them for a boat party or for providing a good experience while towing a wakeboarder, the speakers are easily installed for hanging from above. We have dug deep in the web for online reviews for this speaker set and have found excellent opinions that these are a good choice for the money. Of course, you can’t expect the superior quality and durability at this cost, but they certainly produce a nice sound for what most people require. Another comfortable and strong choice in the under $100 category is the MCM Custom Audio 60-10031 8-Inch 130W/260W Marine Wakeboard Two-Way Speaker. These will set you back for around $94 and provide good quality sound for the money. At high volumes, the sound can become distorted (for those with a scientific leaning, read about why this happens), but this is expected from a pair of speakers at this price. However, if you are simply planning on keeping them at a reasonable volume, then you should be delighted with them. Another potential flaw is that the mounts, being plastic, can be weak, but with good care and a soft hand you shouldn’t have a problem with them at all. After reading over 100 online reviews of this product, we have found that most people are pleasantly surprised at how good the sound quality is for speakers in this range. If you’re not on a budget and you want the top wakeboard speakers, then this is arguably the pick of the bunch. As with all tech gadgets, the higher up the price spectrum, the subtler the technological differences, but these definitely stand out from the crowd. As well as performing well, these speakers look amazing, and will surely set you apart from others. Although they are certainly not cheap, it is not hard to see that the money has gone into produce high quality wakeboard tower speakers. These speakers perform best for being heard at a distance and probably don’t work so well at lower volumes. According to the official website, the speakers have been proven to be heard up to 80ft away without any loss of detail, which is truly impressive. Further, if you’re towing a wakeboarder, they can still be heard clearly when they are outside the wake, which is a sign of good quality. Peak Watts of 600W, the sound that comes from these is impressively loud and clear. You’ll need a good amp to power the speakers in order to fully benefit and get a solid overall sound experience. For this, we’d recommend the Wet Sounds SYN 4 or Wet Sounds SYN 6. Either of these will provide you with plenty of power for an awesome sound, while being well suited to an aquatic environment. If you are looking for a set of working speakers that work well and will deliver a good sound quality but want to avoid paying over the roof, then thoroughly reading the online reviews of the product is highly advisable. We recommend checking the 'Verified Review' annotation available on Amazon; it guarantees that the review comes from a genuine customer that's bought the product, giving you the confidence that the comments are from actual experience with the product. Don't be deterred by a few bad reviews as long as most of the reviews are overwhelmingly positive. When you read the reviews, you will see how people are using the speakers and if they would work for you and your specific needs. 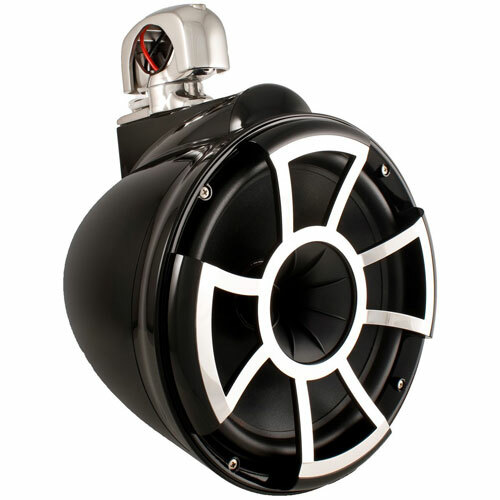 If you want to enhance your experience on the water by listening to music, good boat speakers can be considered an essential, not just an accessory. With that, though, it is important to make sure that the speakers you purchase are designed for being around an aquatic environment. Let's look a bit more in-depth about the features you need to keep your eye on. It's vital that you know the difference between waterproof and water resistant. When speakers state that they are water-resistant, this typically means that they will resist light contact with water, such as water spraying on them, but they will not survive a full-on immersion in water. If you want more water protection, then you need to invest in waterproof speakers. Waterproof speakers can be submerged in water for short periods of time. 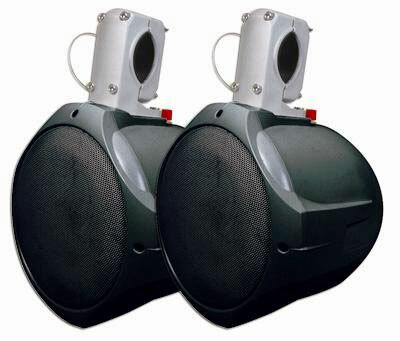 ​Even though it seems a little obvious, you need to double check that the speakers are marine rated. This rating means that the materials used to construct the speakers can handle harsh conditions and terrains, such as a UTV on a muddy trail, or on a boat out in the sea and contact with water. You should also check that the speakers have an IP rating. This classification identifies the protection level the speaker offers against water and dust. An IP, or 'ingress protection', rating is often found on speakers and it can look something like ​IP64. 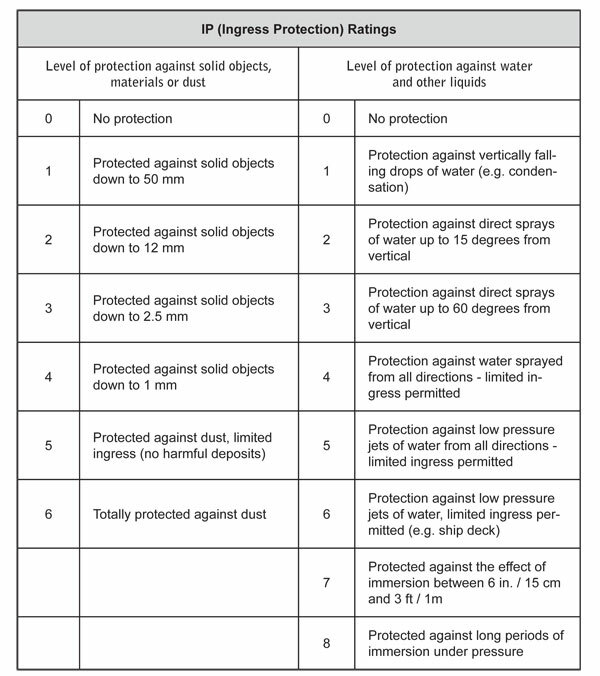 The first number refers to the level of protection against solid objects, materials or dust and the second number indicates the level of protection against water or other liquids. A lot of tower speakers use stainless steel hardware, which prevents corrosion. Sea water and the other elements the speakers will be subjected to will corrode all other elements, so it's best that the speaker's grilles and hardware are made out of stainless steel. Another hardware component which you can look out for is the mounting hardware. Speakers can either have a swivel mount or a fixed mount. Swivel mounts are useful in moving the speakers in the direction that you want. This feature is particularly useful for boat tower speakers, as the sound projection can be adjusted easily. If you do not need flexible movement, then a fixed mount is a good option. Finally, a wee note about wattage: it's not a value that you can gauge independently from the overall picture. This guide does a good job of explaining how watts should be understood as part of your purchasing decision. ​Additionally, we've produced our own guide on the specifications you should care about and exactly what they mean. As we've discussed in our main buying guide above, wake tower speakers have to contend with a much more challenging environment compared to your basic home speaker sets. For this reason, we always recommend that you skip over the cheap versions. You're just not going to get decent sound and we can guarantee that you'll never end up using them. That said, budget absolutely does come into play and if yours simply can't stretch, then you'll be limited to low-end speakers. In addition, the pricier sets will simply last you longer. The materials are generally far superior and considering the wear and tear these will go through while out on the water it's best to invest in a set of speakers that will last. Otherwise you'll find yourself having to invest in a new pair every couple of months - not exactly economical, is it? P.S. As much as it makes sense to invest in good wakeboard tower speakers, it makes even more sense to spend time to get the most out of your speakers.​ What's the point in buying them if you don't get the full experience? The installation process is one that trips people up, especially if you're not used to doing it. Albeit a fiddly process, it's not overly complicated but it does require a bit of planning and preparation. Firstly, you want to position your speakers on your boat to maximize the quality of the sound for all to hear. Will the wakeboarder out on the water hear the speakers just as clearly as you? You need to make sure that there is enough clearance for the rope to move near the speakers but not get in the way. There's no real​ right or wrong when it comes to positioning. Of course, it has to be practical i.e. positioned best for sound output and not getting in the way of passengers or other objects. After that, it can be fairly subject as to what you believe is aesthetically pleasing. Next is the actual installation process. Would you know how to mount the speakers to your tower and then how to wire it up properly? ​Ultimately, before you hit the 'buy' button, you should take all information, whether from us or other guides, with a pinch of salt. Firstly, this is especially true when reading speaker specifications and ratings. Each manufacturer produces their own tests and, although they can be done accurately, there are often differences in test conditions and results between different manufacturers. Secondly, assessing the quality of sounds, style, and overall feel of a set of speakers is largely subjective. What you enjoy, may not be someone else's cup of tea. ​That's why it is useful to get out there and listen to various speakers so that you can get a good sense of what you like.